There are so many beautiful weddings out there. Each one does something which is a notch higher than the previous one you see. As a wedding blogger, I feel I am spoilt for choice. Brides as it is look so beautiful on their wedding day, it’s always a surprise when you get to see more than what you expect. I was aimlessly looking through my instagram feed when I came across the beautiful couple Naaz and Gurvarinder. The first thing that caught my eye was the brides out of the world stunning jewellery choice. It just caught my eye, and then the more I dug through their wedding photos, the more I fell in love. This is one hell of a beautiful Indian Wedding, and the pictures are living proof of it. Here are the things that I loved from their wedding, and you can definitely draw some major trend setting inspiration from this couple. Take note ladies, this is a gorgeous mehendi design to go for. Not too over the top, yet the beautiful peacock and its feathers give it the right amount of bridal look. 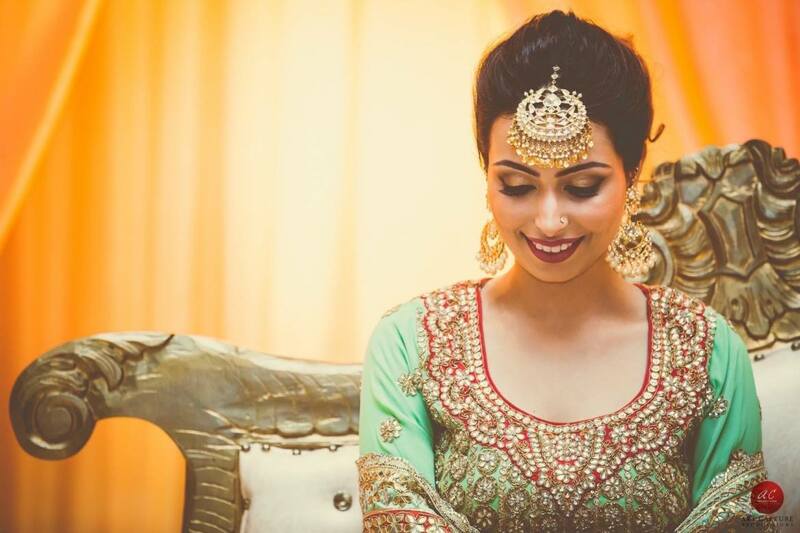 If you’re having a big fat Indian Wedding, you might as well dress up the part, just like this gorgeous bride did on her wedding day. Even though her baby pink lehenga is nice and sweet, the contrasting heavy gold kaleere manage to break the monotony just perfectly. Just look at that beauty. Simple, sophisticated and elegant, the bride shines right through her wedding dress. The dress is beautiful yet, the first look goes on the bride which is exactly how it should be. *Don’t try this at home* Why so? Because the bride has designed her own jewellery for the wedding. No kidding. No wonder it looks so different from everything we have seen so far. Vintage, bold and beautiful that’s how I see it. What do you think? Brownie points to the groom for wearing a white pink floral sherwani. Doesn’t the couple look adorable. 100 points for getting the coordination on point. Ok, to be honest, the idea of the post came after seeing the toe rings. I mean, wow ! Toe rings have always been a traditional jewellery piece, but the bride has definitely taken it up by a notch. Simple, elegant yet that maang tikka though shines throughout. Love how the focus is on one jewellery and not the entire get up. Normally, moms shy away from wearing chunky jewellery, but this beautiful mom has just nailed the look. Bigger is better sure seems to be the mantra of this gorgeous bride. I personally would never have the guts to carry something like this with so much grace, but what an inspiration right? If you’re a bride to be, I highly recommend trying out the bigger than usual maang tikkas for the wedding ceremony. I can’t get over how beautiful Naaz looks on her wedding day. A nath as big as the maang tikka…wow..now that’s rare to see. Also, what beautiful choice of jewellery. Doesn’t she look spectacular? When you’re going all out big fat on your wedding attire and jewellery, how can the decor be left behind? Love the pastel pink floral backdrop for the bride and grooms photoshoot. It might have cost them a bomb, but doesn’t it look amazing? Remember earlier times, every bride would have some florals adorning her hair on the wedding day. It was traditional, almost seen across cultures and looked beautiful. Now I see only some of the south indian brides wearing flowers and that too for the mandap ceremony. I just loved seeing Naaz’s hair accessories in that gorgeous pink roses. Matching with the outfit, her entire look is so put together. Absolutely love it. Forget white veil, pink is here to steal the thunder. What a look. Bonus points for that blingy gold sequins border. Just adds so much more depth to the net veil. The biggest wedding show is back and here’s why you need to attend it!